We all know, Beauty & the Beast is everything to me. I've talked about it many, many, manyyyy times on here before. So of course,when the movie that I've counted down 1,095 days (seriously) to see comes out, I'm going to have some thoughts about it. Obviously. So to start off, I'll give warning ... I guess. I may say some things that are 'spoilers'? ... but I think its hard to have some spoilers when you already know the movie. BUT - saying that, I do think there are some differences in this movie - so I guess you'd consider that spoilers. Anyways - we'll say SPOILER ALERT just to be safe. & I'll mark them in BOLD LETTERS. If you haven't seen the movie & you want to take it all in surprise for surprise, then save this & come back at a later date. If you've seen it, or dont care to see it (Who are you & how are we friend?!?!? (kidding!!!)) then fell free to read on. I wasn't disappointed in the slightest. It was everything I was hoping it would be. Truly. But of course, saying that & being a huge fan, there are some things that I really loved about the movie & some things that I was like, "Meh" on. Things I may have done differently or hoped for. There's nothing that would make me say anything bad about the movie though... know that. I dont hate any part of it that would make me say, "you may not want to see this movie"... it's just my fan heart speaking. SO I'm just going to let it all roll. LOVED - I so adored the beginning of the movie that explains the story. That they added just that little bit to show the Prince in his element, in his castle, as the Princely arrogant character. I think that gave such a good glimpse in his background. It threw me off that they changed the words to it, but they got in a lot more info in that little narration. & I just loved seeing it all come to life. MEH - Saying that - I wish that scene could have been a little longer - or even that we saw the other characters in their human form in action instead of little glimpses of them. I know we saw Madame Garderobe & Maestro Cadenza - but they're not the MAIN GANG. 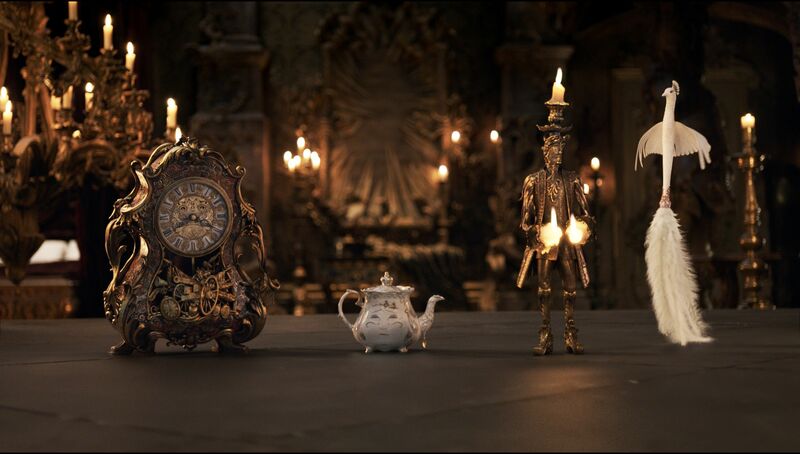 I wanted to see Cogsworth more than a hand with a watch in it & Lumiere than more than holding a candelabra. We totally didnt get enough of the real people even at the end. That was disappointing. LOVED!!!! - Forgotten people! I so loved that they explained how the people had their memory erased by the Enchantress to forget the Prince, the castle & the people there. That filled in a huge gap on why people wouldnt have been concerned their Prince was missing. (SPOILER!!!! - kinda - mild spoiler) & the scene at the beginning where Belle asks the village person if he forgotten something .... & then we see at the end who he is? I SO LOVED THAT!!!! LOVED - Belle teaching the girls to read! Love she has such a love of reading, she wanted all the girls to understand it as well since boys are the only ones in school. LOVED - Belle is the inventor of the story - not her dad. What a fun little twist with her being the one creating things, including the washing machine & her dad was more the artist type. I have to say, in the book LOST IN A BOOK that just came out, Maurice is a music box artist - which tied into this Maurice of the movie. LOVED - Belle's blue dress. I think it was just so smartly done. I loved her pantaloons underneath too. Just the cutest little touches all over that dress. I want to know if the little red strings on the top of the dress represented anything. I was all over looking at the details of this dress. I want one... & the sweater with the blue birds on it too!!! She had the cutest little cardigan sweaters too!!! LOVED - The Enchanted Objects! I saw the pictures of the enchanted objects months ago & I was like, EWWW - I didnt think I would like them at all. I really didnt mind them in the movie. Seeing them in action made a world of difference. I could have handled maybe a different Mrs. Potts - I dont think she had a lot of personality, but Lumiere & Cogsworth & even Chip were spot on for me. MEH - I'm still not sure why they changed Babette to Plumette. I guess they needed her to be able to fly so changed her look to the bird instead of a plain feather duster... & its just nit-picking, but she's a main character to me. Babette is one of my favorite rare characters. My step daughter painted a picture of her for me because I think she's so cute. So I was disappinted this character got a full over make over - including name. LOVED - the Castle. The inside of it was so beautiful. The outside of it was gorgeous. The grounds of it - stunning. It was so perfectly done. Brought to life even better than I could imagine. The HUGE stone work & the amazing chandeliers & stair cases. It was so magical. MEH - Be Our Guest. I wasn't overly thrilled with one of the biggest scenes of the movie. I had heard it took them over 6 months to create that scene, but to me, it came across very quickly done. I didnt see anything special about it. It just looked 'cheap' to me where everything else looked so grand & put together. & I'm still not even sure about that scene with Mrs. Potts getting her inner Ester Williams going on or what? Nit-picking again, I know. The Broadway play even does it better. LOVED - Most of the background instrumental music when Belle is in the castle is the song that is played in the Broadway play called "Home" that Belle sings a solo too. I kept singing it every time they played it in the background. LOVED - Mrs Potts only had one cup, Chip. In the animated movie, I know everyone always wondered if all the other cups were her kids & why she only preferred Chip - but in this one, I love we see only her & Chip share a cupboard. LOVED - Wolf Attack Scene - we see another explanation that people get upset about when the Beast is hurt & they say, there's now way she could have lifted him on the back of the horse. MEH - Philippe. I just wish he was the same color as the animated movie. Phillipe is a huge character as well to me.. I get white is more regal & plays well but still... goes back to Plumette - messing with main characters to me. MEH to LOVED - I wasn't sure how I felt at first when I heard that the Beast could read in this one. I didnt like it when I first heard it. It's a huge part of how he & Belle fall in love - she reads to him - teaches him to read. But it makes sense that he had an 'expensive education' & has read a lot of books & very knowledgeable. & I ended up really not minding it because they connected on that reading level. Well done Disney changing my mind on this one. LOVED - LeFou. I just LOVED him. Josh Gad did the character so much justice. He was funny, added in some humor only like he could. & I loved the redemption he had by the end of the movie. I so enjoyed this character in the live action film. As for the 'controversy'... can I say, I have NO IDEA what they were even talking about? I mean, I get there's like a 3 second blip of a scene in a dance, but I dont even think its what they called "A gay moment" - isnt what they said in the publicity stunt - because that's all it was, a publicity stunt. I heard that some country said Disney had to cut out the 4 minute scene with Lefou so they could show it - I dont even know what 4 minute scene it could be. Truly. LOVED - Gaston. 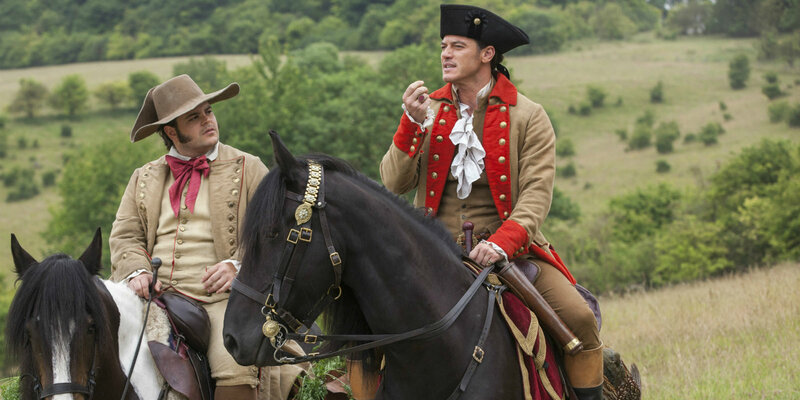 I wasn't sure I was going to like the Gaston actor either. I just envisioned someone BIGGER - more muscular. But men, he really pulled off the smugness well. LOVED - Gaston (the song) - I love they added in a line that was originally going to be in the cartoon version but they thought it might be too much for little kids - about shooting a beast in the liver. Not very child appropriate I guess - but I'm glad it got included in this one. MEH - the worst MEH to me in the entire movie. OK... I'm going to preface here. The library scene to me is the most epic of all the scenes in Beauty & the Beast. 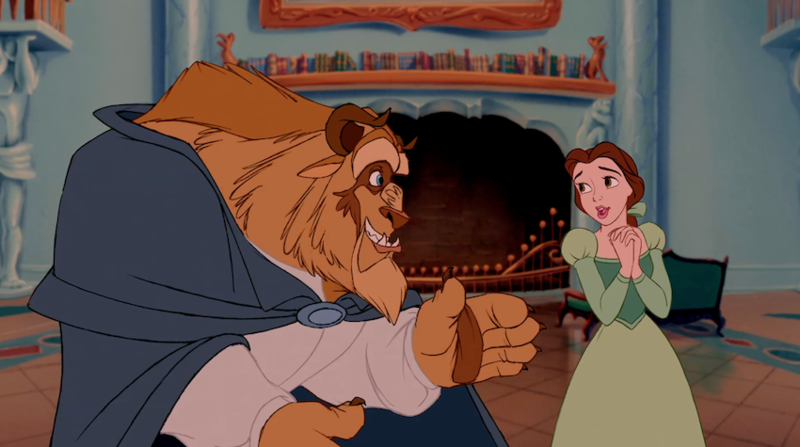 He gives it to Belle to impress her - to win her over. In this movie, he's taking her in there to argue with her about Romeo & Juliet not being the best book there is when she is stunned about walking into a huge room full of books, & he's just like, "You like it? It's yours"... not any thought in it. It's such a gesture in the cartoon... something to make her happy. This is just like a "Whatever"... that hurt my heart more than anything in the movie. That yellow dress. I've been very vocal since they released the picture of the yellow dress that I didnt like it. To me, its a ballroom scene. I wanted a ballroom gown. Something huge & elaborate - royal looking - fairy tale quality. This just looked too plain. Simple. Especially for this amazing gorgeous ballroom where even the Beast has an embroider jacket that is stunning. .... but I will say, I did like the dress more in action. It flowed & floated better in the dance scene that I thought it would & it did win me over. It suited THIS Belle. & probably what makes me say I could LOVE it is because it plays well in the following scenes where she's riding a horse & in the village with the crowds. In the original, when she leaves the castle, she switches back to the blue dress, so I can appreciate she stays in that dress & they needed something flexible. Believe me, I've had deep conversations over this dress. That I can say its not a total MEH now is huge progress. LOVE - The Beast singing voice. I wasn't sure what Dan Stevens was going to sound like. 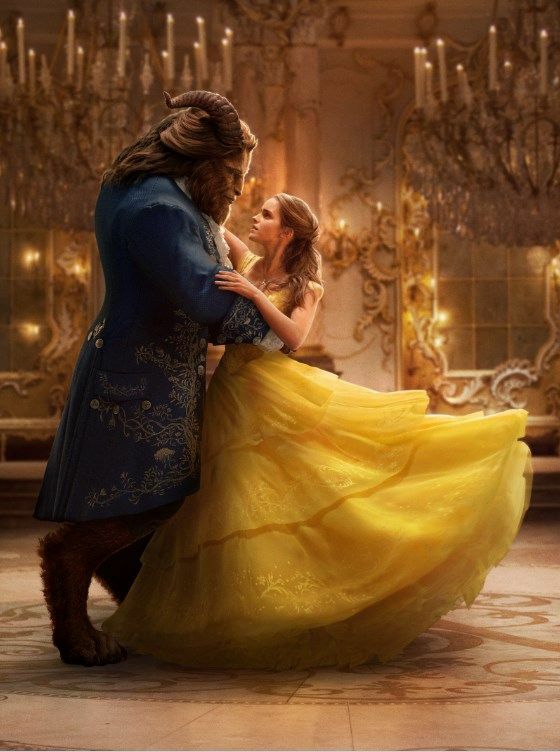 We had the sneak peek of Emma Watson singing but nothing from The Beast. I was so happy to hear his singing voice sounded just lovely. I'll also add to this I loved the new songs in the show. 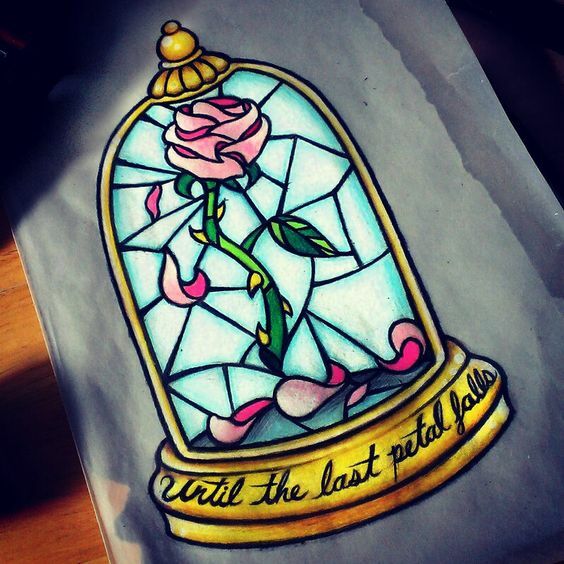 **FUN side note... this new song is called "Evermore"... in the new Beauty & the Beast book, Lost in a Book, Belle gets trapped in a story called Nevermore... I thought that was clever. LOVED - Rose rattle. I need to find one for every baby gift in the future. MEH to LIKE to LOVE - the CGI Beast face. At first, I wasn't too sure I was keen on the CGI face. It looked a little TOO animated to me. But then throughout the movie, I could really see where they used Dan Steven's expressions. If you watched Downton Abby, you would recognize them. It gave the Beast more 'life' to me - more realism (if you will) & then by the end, I didnt even see the CGI - I just saw The Beast as a real man.. you know what I mean. & did Belle not see the Enchantress standing right there? Blah... maybe I hate that part as much as I hate the library thing. Probably equally the most disappointing parts of the movie to me. LOVE - the final scene. oh my word. Belle's dress in the last scene - that was 100% better than the yellow dress to me. I didnt realize it watching it but apparently that was her wedding dress... which makes me swoon & want a vow renewal so I can wear this dress. Truly gorgeous. & I have to add, Emma Watson looked so naturally beautiful throughout the movie, especially with her little freckles. Adorable! I loved that I just saw an interview with Emma Watson & they asked her what she thinks happened to Belle after she & Beast - who technically isn't a Beast when they got married??? - (Add a MEH because we STILL didnt get a name in the movie!!!!) anyways - what happened to Belle after they got married. Oh yes... THAT'S A LOVE... a perfect happily ever after!!! I'm sure I'm missing a lot of things that went through my mind... you can imagine I digested every bit of it... & still will. I want to go back for a 3rd... maybe a 4th time. After all, I did see the original 4 times in the theater. & yes, I already have the soundtrack on loop in my car... & counting down for the DVD to come out with exclusive scenes! I read it all - even the spoilers! :) - and have a mom/daughter date to see it on Thursday. Can't wait!! Awesome review, Rebecca Jo! Can't wait to see it with my girls this weekend! They're already asking if I'm "sure" we're going! Ha! Would this mama lie to you?! I think I'm going to hafta buy tix in advance though! I haven't seen it yet and want to (hopefully this week!) so I'm skipping this post for now. Wow, wow and wow, way to get us soon to be viewers pumped up!! Yippee for your all star review!! I am just shaking my head in agreement in so much of this. I TOTALLY agree about the Enchantress - why wasn't she light at the end of the movie when doing all her magic (after the last petal fell?!?). Speaking of the Enchantress, my most "meh" moment was the SUPER QUICK "hey, here's this book where I can see the world and go to Belle's past...but let's only talk about this for 2 minutes." Yes, I absolutely loved how they flushed out the whole story a little more (Belle's past, wiping everyone's memory, etc), but the enchanted book thing just seemed really forced and then never mentioned again. Also, Josh Gad was amazing, and he was probably my favorite. I was so happy when he became "good" at the end! Ugh I could talk with you about this movie all day! I haven't it seen it yet but I read the entire post, spoilers included because I wanted to hear your thoughts. You're my biggest B&B fan! That wedding dress is gorgeous. I don't even remember Belle's dress at the end of the animated movie. The yellow dress is always the one that stood out. I'm glad that dress became an almost love for you. From the pictures, it didn't wow me either but I was hoping within the scene and a little movie magic, I would love it. It makes super happy to hear that you loved the song Gaston because it's actually my favorite song from the movie. I know - weird. :D It sounds overall like a huge winner and I can't wait to see it! Great review!!! I loved the move too and thought they did a great job with it. I was confused about the ending too and her saying I love you after. I did hear it was to show that true love conquers all. But, that was the deal so I was thrown off. Haven't seen it yet, waiting to at some point, so I had to skip most of the post. I will admit I'm a bit nervous for it because the animated movie is just SO GOOD. I'm not quite as deeply in love with Beauty and the Beast as you are. I mean, I liked it, but I can't remember the last time I watched the animated movie. I enjoyed the musical, but I think I only saw it once, unlike some other shows I went back to over and over again. I do have the CD of the musical, so I'm familiar with the music. It's interesting that you focus on the reading piece. I never really understood why a prince WOULDN'T be able to read, so that was kind of an improvement in my mind. I wish they'd used "Human Again." 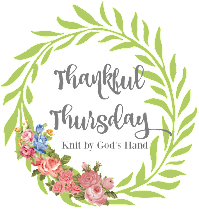 While I was recovering from severe anemia and my hysterectomy, I kept thinking of that song because I really was starting to feel human again after a certain point. I don't know why you'd cast Audra McDonald and not give her more to sing. To my mind, she should be singing every song ever recorded for anything. I went to the film with my mom, and I whispered to her that the enchanted castle shouldn't be a big deal to someone who'd grown up in one. She replied that that's why Belle wasn't frightened. 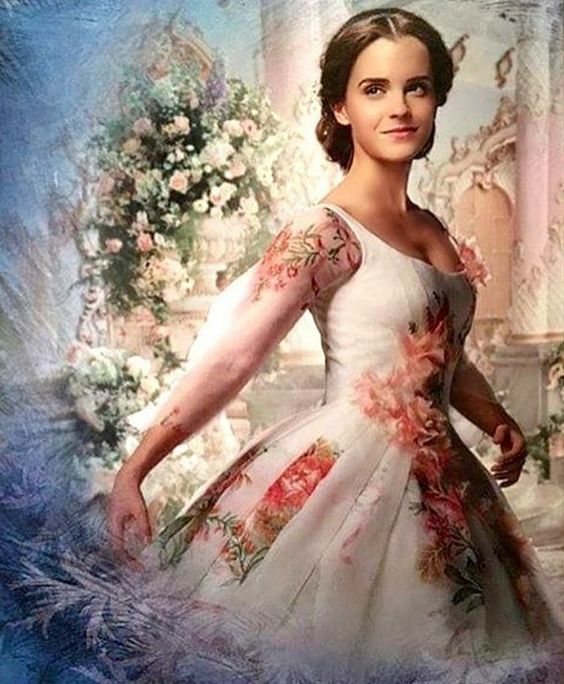 I liked the casting of Emma Watson as Belle. She just fit. The gay controversy cracked me up with all the people claiming they wouldn't ever take their kids to a Disney movie ever again. To me, to be upset over a blink and you'll miss it moment that may or may not be interpreted as gay from a movie company that violently kills off mothers on a regular basis is a bit hypocritical. TBH, I'm not sure which scene was the "gay" one because I thought a lot of moments could be read that way. In the beginning when the one character asks "How is your wife" I'm pretty sure it was a man that popped up from behind the table. LeFou has always come across as gay, and then there was the moment of bliss the one character had when he ended up in a dress and the two men dancing with each other at the end. All of it was pretty mild and nothing to get upset about. Much of it was just played for laughs and not a political statement. As for the dress...I saw that white one at the Disney Store months ago. I wish Disney wouldn't market so much ahead of time. I get that they're all about creating anticipation, but I would have liked to see the reveal on screen instead of a little girl's version in a store. I'm so glad you enjoyed it! I can't wait to see it! Wow this is a totally in depth review! I'm definitely going to come back and read it more in depth later Becca! Thank you! It was so cute seeing you take your gals with you. I missed several of the things you mentioned. But I have to say, I loved that yellow dress and especially the scene where they added the gold to it. That was just so neatly done. I haven't seen it, but I'm glad you liked it so much! I do think the yellow dress looks lovely in that photo you posted. SO interesting to read your thoughts! I haven't seen it (and will probably wait till it's out of the theatre because I can never justify $20 movie tickets these days! ), but I really enjoyed your perspective on everything. I just saw it last night and like you I LOVED it! I would recommend people go see it. Now, having said that... one meh I felt was I wished Emma Watson showed more emotions. There were a few times in the movie where something extraordinary was happening, she'd have a slight smile or even just a straight face. I didn't make the connection in the part when she asks the village person if he forgot something, not until you said it! Great catch! I too loved, loved, loved the castle, inside and out. I also was a little disappointed in the library scene but I was happy when Belle finally squealed with delight! Such a great movie and I can't wait to see it again! I loved LeFou. I loved that he has a conscious and I loved his comic relief. And the whole controversy... Um... in the animated movie LeFou fawned alllll over Gaston and told him how great and big and strong he was. This movie was over the top and whimsical and I feel like they just capitalized on the man crush LeFou already harbored, lol! I loved all the outfits. I thought Emma/Belle was stunning. I, too, loved Dan's singing voice. I thought it was lovely. I also loved Emma's! It was crazy or anything, but it felt very familiar yet magical. I thought it made her even more relatable and pretty. I didn't feel like Gaston was especially evil at first. I felt like his determination and ego and sexism slowly turned him more and more malicious. I loved how that actor portrayed him. I definitely wanted more of the characters in human form- HELLLLOOO, Emma Thompson & Ian McKellen!! I loved that they still bonded over books. I was underwhelmed by the library gifting, too, though. I wish we'd have see more of the prince's past. I feel like they could've done more with that flash back. I also don't understand WHY we know more about the enchantress... I get that her story was dragged out, but why? She still didn't tie in anywhere. the scene with mrs potts looking for chip, oh emotions. and when lumiere says to cogsworth the honour was all mine? ahhh i was bawling. i can't believe you didn't mention the growl at the end.. thoughts?! and yes to babette. she's one of my faves and i did not like the bird. maybe they thought the feather duster wouldn't fit with the rest of the characters? like look out of place? i wish we got more of the characters in human form, either at the end or beginning. and seriously, still no name?! i know his name is like widely recognised as adam, but i wanted confirmation! I still can't wait to see this movie. And I read the spoilers, but I don't care. I wanted to know what you thought of it!! !